The Khayer Lake Trek is one of the best treks of the Annapurna region that modestly offers the masterful abundance of natural and cultural riches in the region. While mediocrity is non-existent in the Annapurna region, the Khayer Lake Trek assimilates the delightful authenticity of the Himalayas, residing culture and bio-diversity in such a magnitude that it is almost impossible to properly describe the trek without cherishing its stupendous quality. The beautiful Khayer lake Trek begins from the gorgeous Pokhara city- the tourist hub of the country. The trekking trail initially follows the same route as the famous ABC Trek, but towards the village of Tadapani, it diverts its course and instead goes towards the far-off settlements of Bayeli Kharka and Sikha. Trekkers can enjoy many prominent Gurung and Magar villages of the region as well in addition to the alternate settlements encountered later in the journey, like Ghorepani and Ulleri. The Khopra Ridge, one of the highlights of the trekking journey presents trekkers with an astounding view of the deep Kali Gandaki Gorge- the deepest gorge on the planet. 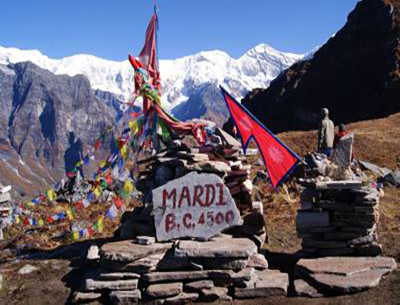 Standing at the ridge, trekkers can take in the enormous feeling of the landscape and the distant views of the Annapurna and the Dhaulagiri peaks. Moreover, the path also leads towards the Khopra Lake, a hidden gem of the Annapurna region. The trek follows a route which majestically presents the serene lake situated beneath the watchful eyes of the sublime Himalayas. Mesmerizing you over the entirety of the trek, each step takes you amid the solemn nature of the region. The Khayer Lake Trek is an easy trekking journey that requires no previous trekking experience to do. The best time to do the trek would be during the months of March to May and September to December. 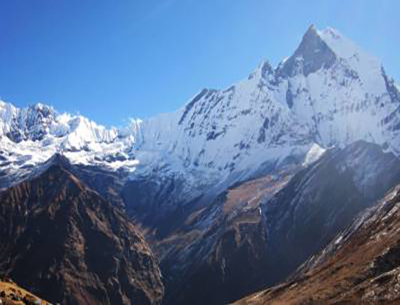 The Khayer Lake Trek package by Destination Unlimited is the best trip for trekkers who want an alternative option for trekking journeys in the beautiful Annapurna. It has been crafted with the utmost attention to the best services and incorporating the best features for our valued customers. We are cautious about the demands of our clients and provide excellent services to meet their expectations. Upon your arrival at the Tribhuvan International Airport, you will be greeted by one of our company's staff members. He will help you get to your Hotel. Overnight stay at the Hotel. From Kathmandu, you will have a scenic drive to Pokhara- the gorgeous lake-side city and the famous tourist hub of the country. The drive is quite pleasant as you will be making your way through winding hills and verdant farms. As you approach Pokhara, you can see the Annapurna (8091m) and the Machhapuchhre Peak (6997m) beginning to form in the skyline. Overnight at hotel in Pokhara. From Pokhara, you will have a short drive to the settlement of Nayapul that is located close to the city. The road travels upstream along the Seti Gandaki River. From here, you will begin your trekking journey. Crossing a couple of steel bridges, you will reach Birethanti from where you will take the left path of the forked trekking trail and pass through the villages of Mathathanti and Lamdawali before eventually reaching Ulleri. Overnight stay at the Hotel. From Ulleri, the trek today consists of you walking up the stone stairs that are cut into the stone cliff towards the Magar ethnic village of Ghorepani. There are more than 3000 steps on the stairs! However, the view of the mountain peaks like the Hiunchuli Peak (6441m), the Machhapuchhre (6997m) and the Annapurna range will keep you company. Overnight stay at the Hotel. Ghorepani is one of the best places for trekkers to stop for the night. It is a beautiful ethnic village that presents astounding views of the mountains. From Ghorepani, you will trek deeper up the elevation, pass through emerald woodlands and rhododendron forests and past pastures to reach the settlement of Tadapani. Overnight stay at the Hotel. From Tadapani, you will be leaving the main trail towards the ABC and instead traverse on an off-beaten path that goes through lush rhododendron and oak forests. The trail then slowly ascends through the tree line and continues to Deurali. Further up from here is Bayeli Kharka from where the majestic view of Mount Dhaulagiri (8167m) is quite awe-inspiring. Overnight stay at the Hotel. Trekking on grassy slopes, you will be traversing through pasturelands rich with Himalayan foliage and blooming foxgloves. You can keep a lookout for colorful Danphe pheasants on the grassy ridges high above the trail. As you continue, you will see the tip of the Annapurna South (7219m) emerge, a sign that you are getting close to Khopra Ridge. 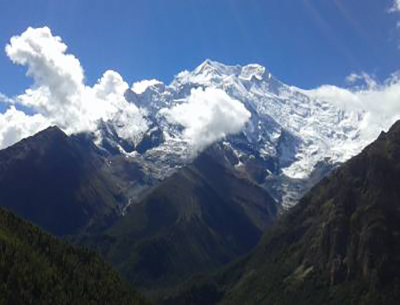 From the Khopra Danda, you can enjoy the full panorama of the mountains like Mount Dhaulagiri (8167m), Nilgiri (6441m) and Annapurna South (7219m) among many others. Overnight stay at the Hotel. You will make your way to the Khopra Lake today. From the lake, the views of the Fang Mountain (7647m) and surrounding peaks are dramatically magnificent. It is a long walk up to the Lake through amazing lush woodlands and jaded pastures. After taking in the beauty of the lake's surroundings, you will trek back towards the settlement at Khopra Danda. Overnight stay at the Hotel. 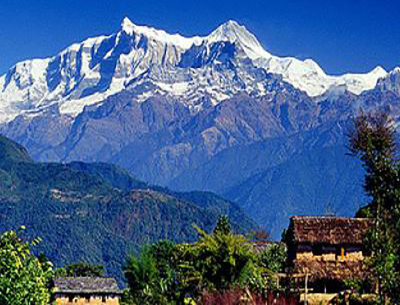 Continuing the trek, you will be trudging to Sikha- a beautiful ethnic settlement. Along the way, you will constantly be in the company of Mount Dhaulagiri (8167m). The ambiance of the trekking trail with the Himalayan backdrop is brilliant. The terraced farmlands and traditional houses along the way also give the landscape a picturesque sublimity. Overnight stay at the Hotel. 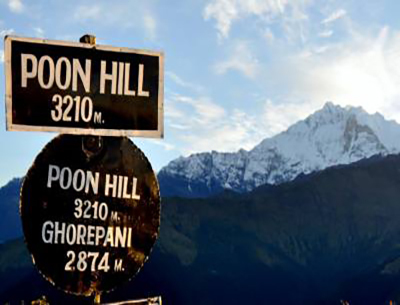 From Sikha, you will descend steeply down along the terrain towards Tatopani. The village of Tatopani is famous for its natural hot springs. Upon reaching the village, you can have a relaxing dip in the hot springs and soothe out your muscles. The springs are also known for their healing properties. After a short respite at Tatopani, you will then drive back to Pokhara. Overnight at Pokhara hotel. From Pokhara, you will bid the mountains goodbye and drive back to Kathmandu, meandering along the same road with beautiful countryside scenery. The city of Kathmandu is a great place to shop for gifts and souvenirs. You can also opt to explore around the city during the remaining time after arrival. Overnight at Kathmandu hotel. Day 12: Transfer to Kathmandu International airport for final Departure.